The citizens of this beautiful Island are past masters in going round in circles; when it comes to governing themselves they display their prowess in this art in no uncertain terms. For example when they voted Sirimavo Bandaranaike out of power showing their displeasure of the mode of governance they were subjected to during the 1970-77 period , they ushered in a neo-liberal economic style and attendant political system to facilitate it. After 17 years of this experiment they were wooed by Chandrika Bandaranaike who wanted to give this ‘Open Economy a “Human Face”. As to what that human face looked like after 11 years of CBK-government is not clear; in any event they opted to go for Mahinda Rajapaksa instead of Ranil Wickremesinghe, the Sinhala Buddhist majority voting for Mahinda while the middle class and urban Sinhalese segments along with overwhelming minority vote opting for Ranil who felt just short. When people gave a farewell to Mahinda, it was not for anything else but for the cleaning up of the governing apparatus that had been defiled by then by nepotism, corruption, favouritism, malpractices and all vices attributed to ruling. In short, they wanted the mess cleaned up, the system overhauled and a new method of governance introduced. That the Yahapalanaya failed miserably is an understatement; in addition to not being able to punish the culprits who robbed the national coffers dry, they in fact were accused of colluding with robbers themselves. So a protest vote was on the wall in the local government polls; yet the shape it eventually took, did come as a surprise to many. The Joint Opposition augments the result to the maximum demanding that the government resigns which in other words means they should be in power. The UNP tries to downplay the impact by reducing it to a red warning. The President , obviously the most alarmed by the result, promises drastic change. My attention lies elsewhere. After celebrating 70 years of independence why are we still running in 360 degree circles, from pillar to post in finding a national leadership that could deliver the goods to the populace. Is it wishful thinking to aspire for leadership that is efficient, strong, development oriented yet at the same time deferential to individual liberties, cosmopolitan in attitude and modern in outlook? There is little doubt that the economic policies pursued by the two major parties will be nothing but the free market economy, irrespective of the jargon associated with their planning and different shades that one might detect in their economic concept. In that respect there could be little difference in the approach of either of the main two parties. It is going to be neo-liberal yet service sector oriented and heavily reliant on foreign loan and investment; the only voice that questions this path is the JVP ; they challenge the path taken during last five decades. All agree with them in the abstract but the polling booth does a strange thing to the voter! 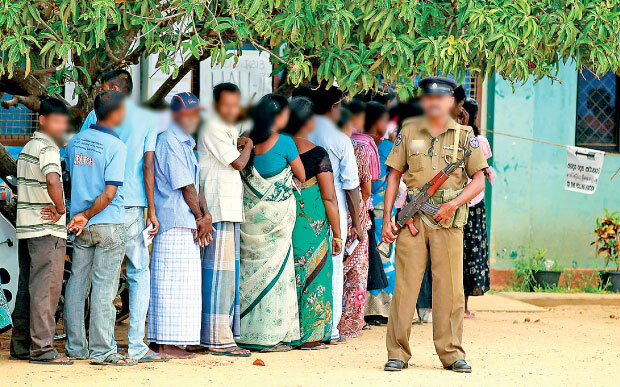 A development drive, albeit with heavy collateral damage to a democratic social fabric, was disrupted by the 2015 January and August elections which saw the Rajapaksas out. The message was that it was not to be economic growth at any cost; that people were disgusted by the tyrannical, despotic and high handed modus operandi of the regime and their henchmen. The green/blue combination was more keen and in fact , mandated to bring in changes to get back society in to a normal footing , by introducing democratic and liberal minded reforms that would take the country out of the deep well it had fallen during prolonged civil war and a polarizing regime. Such deep rooted reforms take time and the results are hardly tangible within a few years. A society that had been paralysed for three decades with battle cry and more attuned to a tribe like mentality that pays little attention to civil liberties of individuals, is hardly suited to evaluate structural and normative changes that underlies reforms of the nature brought about by the green / blue coalition. I am not accusing the majority of being insensitive to the deep-rooted constitutional and structural changes that were in the pipeline; in fact I do not say that it is mandatory that they see those as necessary even. Yet my grievance is with the flip flop stance that takes us round and round with our choice of governance. Saddam Hussein modernized, developed and galvanized Iraq to an extend that would have been unimaginable if not for the ‘Bath’ party rule that he unleashed on the society. Yet the attendant damage to social fabric was chilling and beyond evaluation. It was a heavy cost for the economic growth and modernization for Iraq. Yet the Iraqi people decided in was a price worth paying for. One might be critical of my comparing the Saddam regime with our context and justifiably so. Yet the point I am trying strike home is that we need to persist with any type of approach to governance and development if we are to get anywhere. Had we persisted with the Sirimavo experiment of a closed and self-sufficiency oriented model for another 10 years, more likely than not we would have achieved an impressive growth. It is too early and quite premature to see omens of a collapse of the good governance coalition; yet that there is a potent and diametrically opposite opponent lurking in the social conscience of the citizenry is no longer a figment of the imagination. It is a hoard that is in direct contrast to what the coalition government is made of. It has as its vision an entirely different dynamic of racially and religiously polarized society and authoritative and opaque economic decision making that yet delivers results. It has not ceased to flirt with the public conscience and national will, if not of the entire populace, at least with the Sinhala Buddhist segments, going by the local government polls. The talk about ‘the lesser evil’ is hardly convincing in my mind as it is longer possible in the local political arena to discern as to who is more evil. Are they the MiG dealers, Avant garde crooks and hedging scammers or alternatively, the bond scammers who are more evil, is a very pertinent question. Whichever way the majority answers this question, it should be borne in mind that dozens of countries in Asia, Latin America and Africa competing for economic prosperity in an international order that does not have a single super power any more, but a multi-pronged leadership in the global community, time is running short for Sri Lanka. Yet it is the will of the people; if they wish to run around in circles, who are we to say don’t?